Designed by Andrew McDonald-Smith (Lloyds Ships. 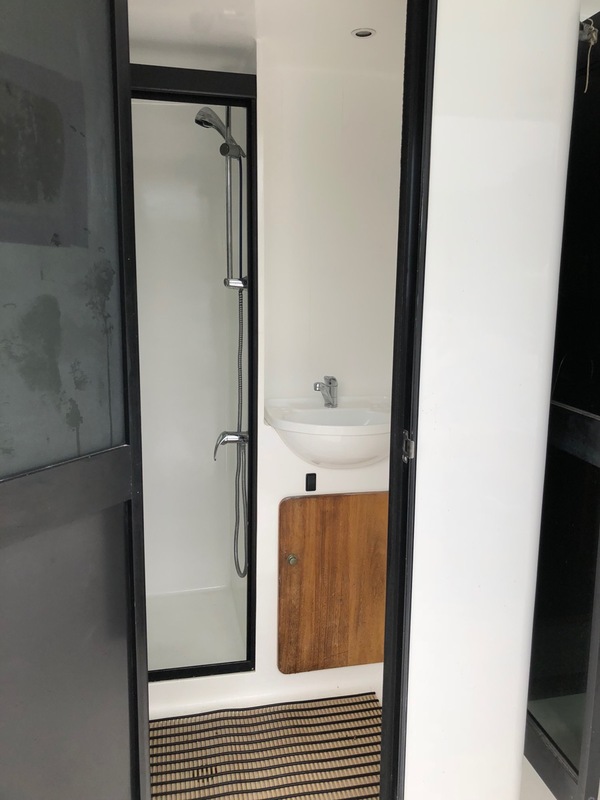 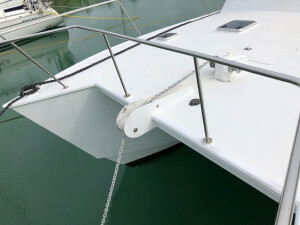 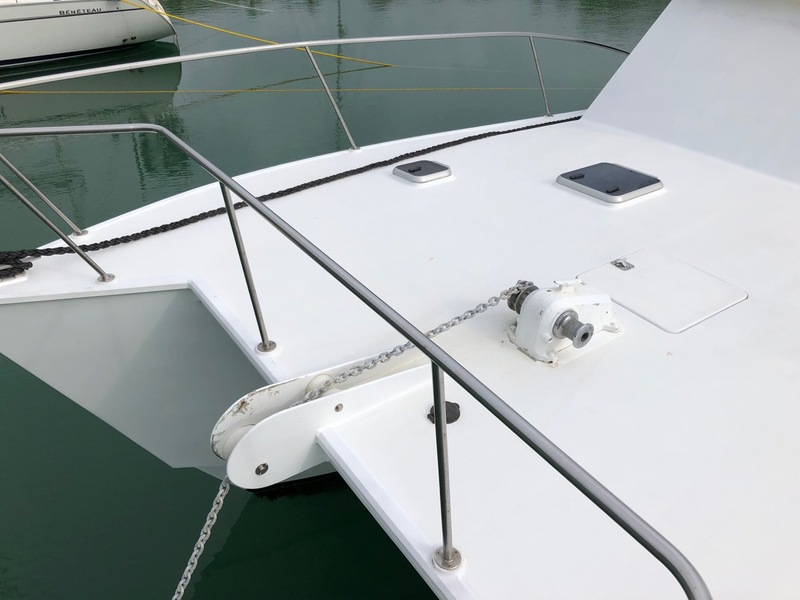 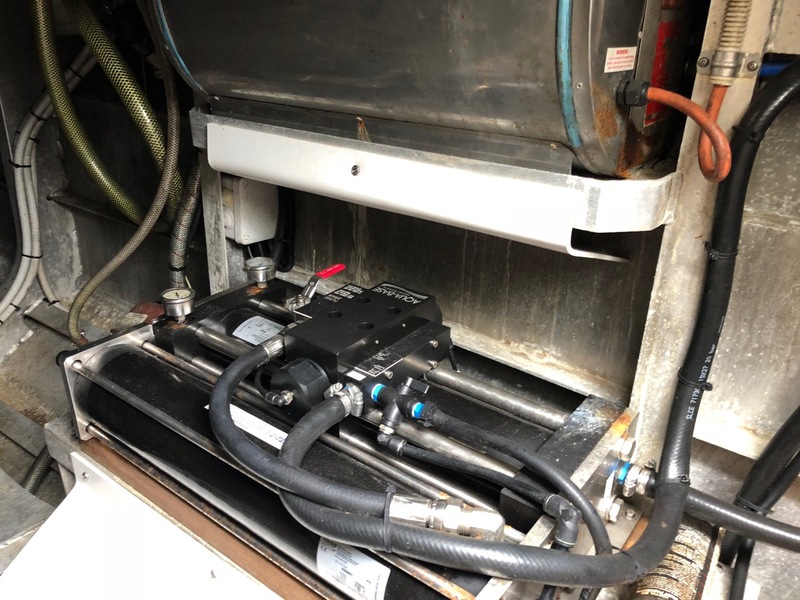 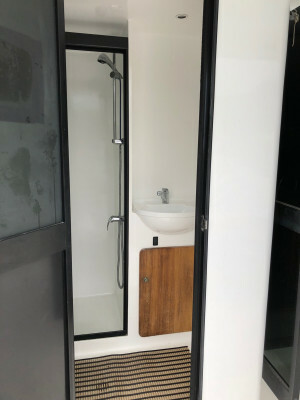 Marine Designer-Australia), this 48' power catamaran was built to comply with the most stringent quality control and to sustain the most gruelling sea conditions. 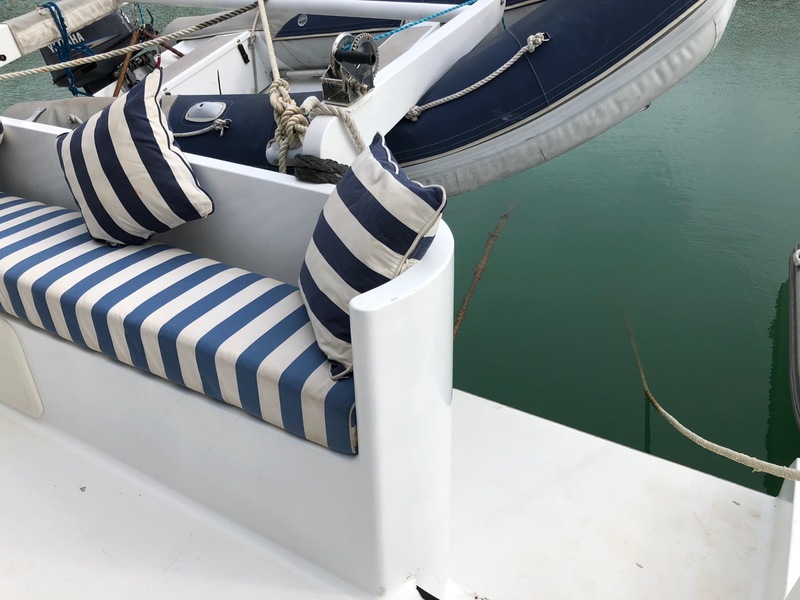 Her owner had her built by the very best aluminium boat-building specialists in Australia, Coral Coast Marine Construction Pty Ltd, a company specialising in shipbuilding of both commercial power catamarans as well as large luxury pleasure crafts. 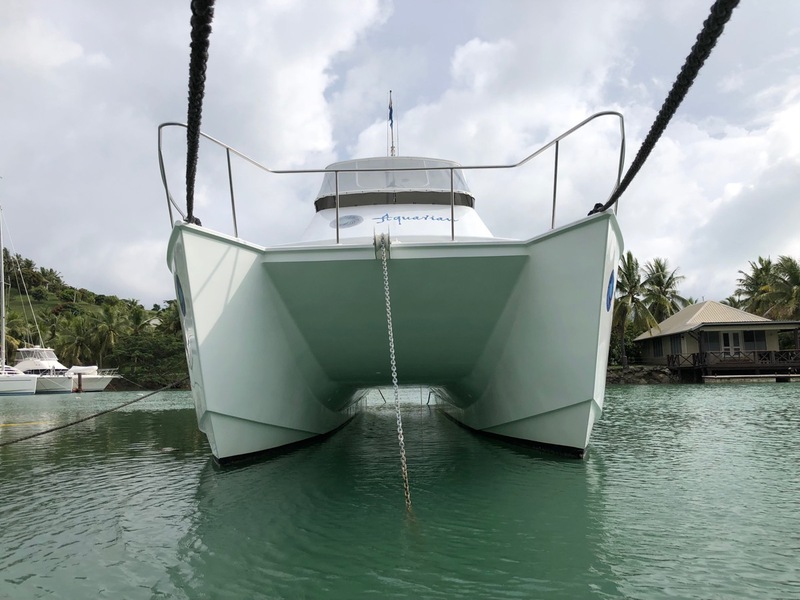 Operating his own Marine Design business for the past 8 years, Andrew McDonald-Smith's personal portfolio (spanning from 4.3m to 20m vessels with thousands of designs on the water) as been acknowledged with numerous Australian awards as an independent designer. 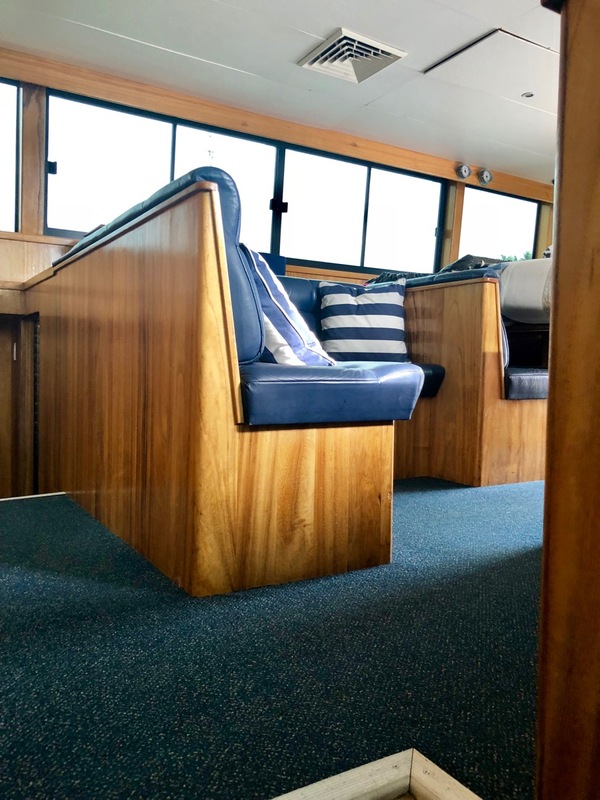 Andrew works closely with the owner and yard to produce the best result for all parties, with clients receiving 100% effort to completion. 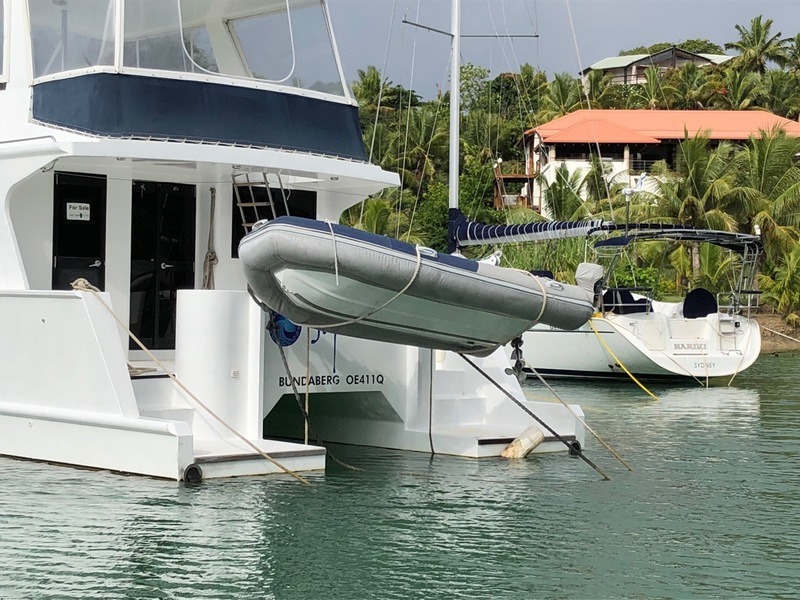 As a Mechanical Engineer with a trade back ground, Andrew McDonald-Smith began Marine Engineering and Design 20 years ago with Lloyds Ships and has since worked with South East Queensland's foremost luxury yacht building yards. 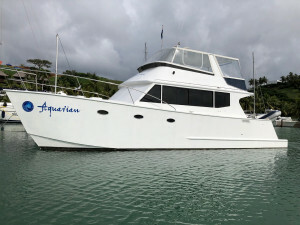 'Aquarian' is fast, long-distance cruiser, having cruised several times between Australia and Fiji in records time. 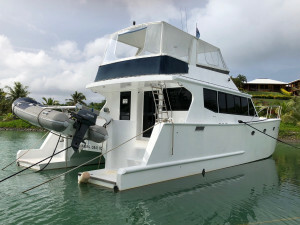 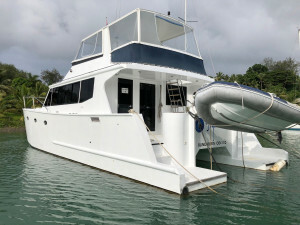 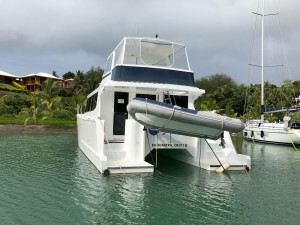 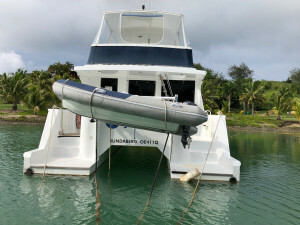 Built to comfortably and effortlessly cover huge distances in all weather conditions, her owner brought her back and forth between his home in QLD and his other home in the beautiful Manamuca Islands in Fiji, where the boat is now being imported to be able to permanently remain in Fiji, including having her own private harbour well protected from cyclones. 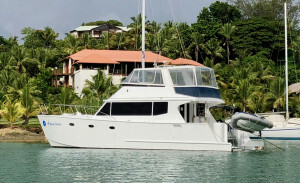 Aquarian has also been imported in New Caledonia, where she can also remain indefinitely. This could be very interesting for someone wishing to spend extended amount of time either in Australia, New Caledonia or Fiji, where cruising permits normally last 12-18 months. Built of 4mm thick alloy above the waterline and 5mm below, over an extremely strong aluminium frame and grid, this veritable ship means business. She was specifically chosen by her owner to be able to safely cruise the sometimes tricky waters of the Pacific Islands, where uncharted reef abunds, as well as sustain some of the roughest ocean conditions. 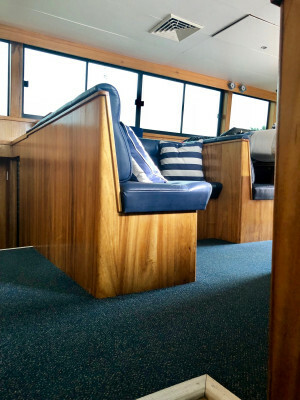 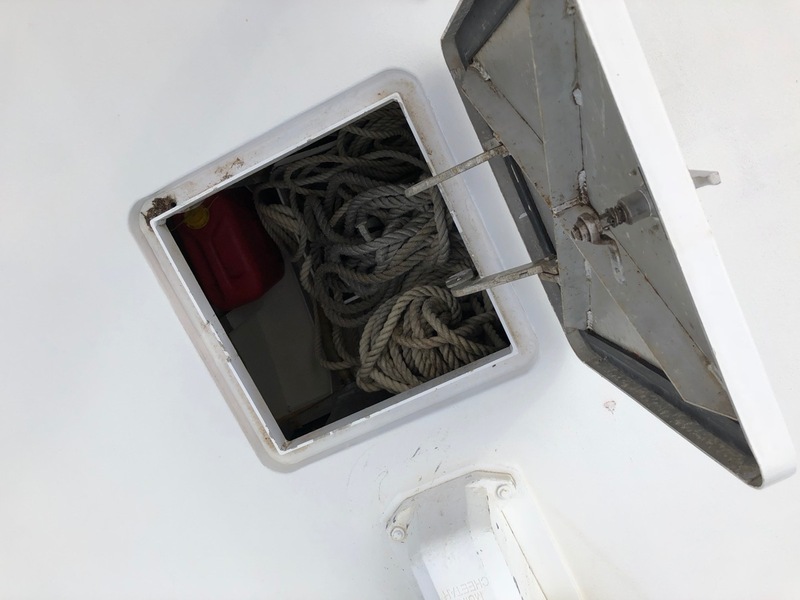 Her hull is insulated above the waterline to keep the cabin cool in the hot weather, and warm when it is cool as well as protect the cabins against condensation. 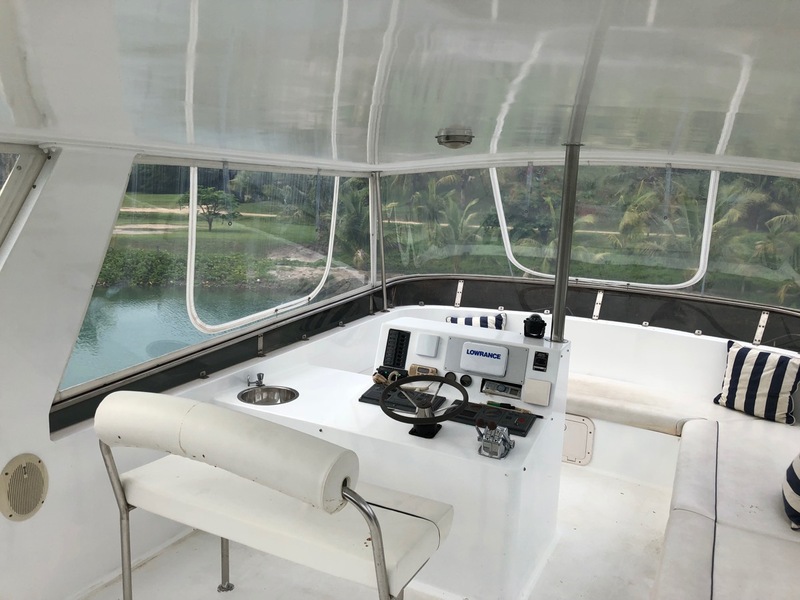 Having had another larger power catamaran of the same design built in Australia, 'Aquarian's owner has now decided to sell the smaller boat, which is presented in immaculate condition. 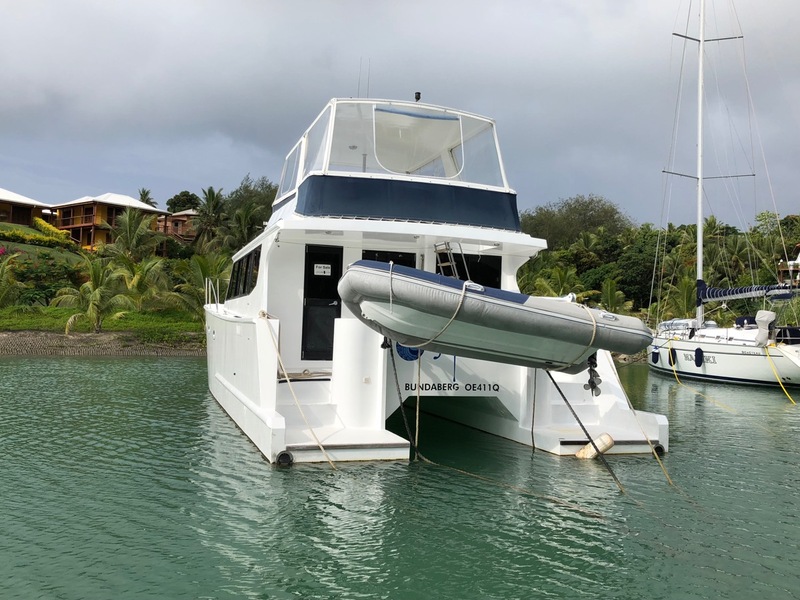 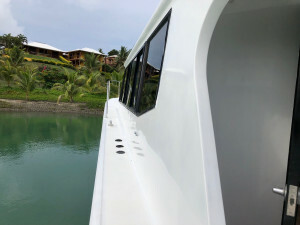 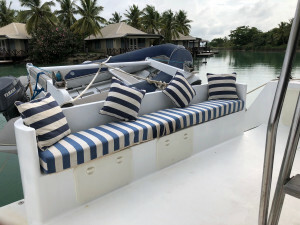 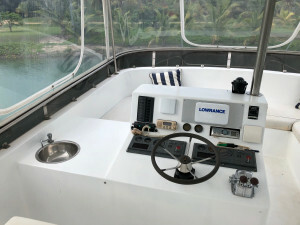 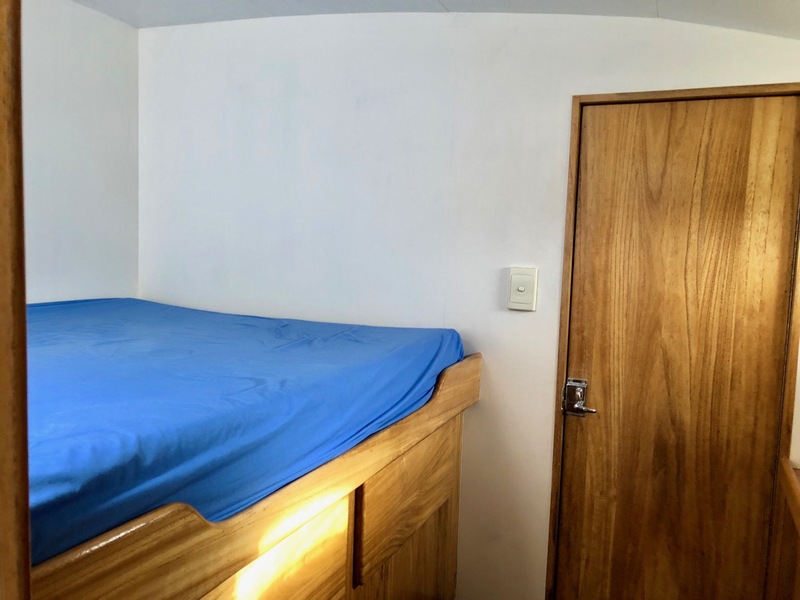 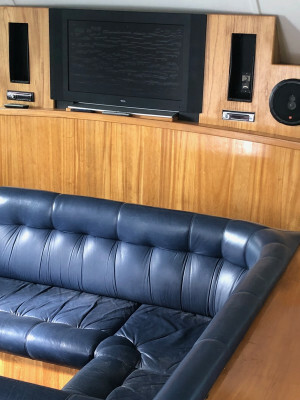 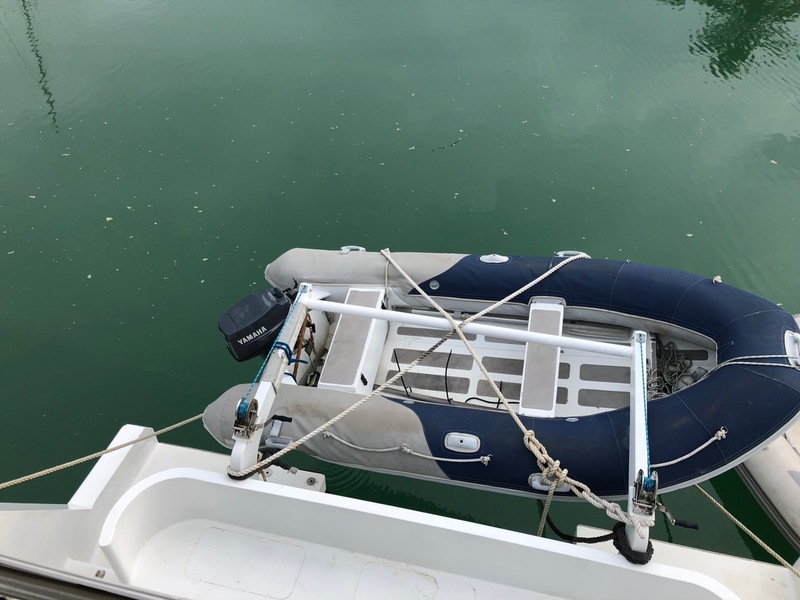 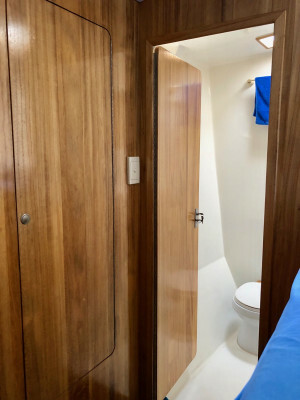 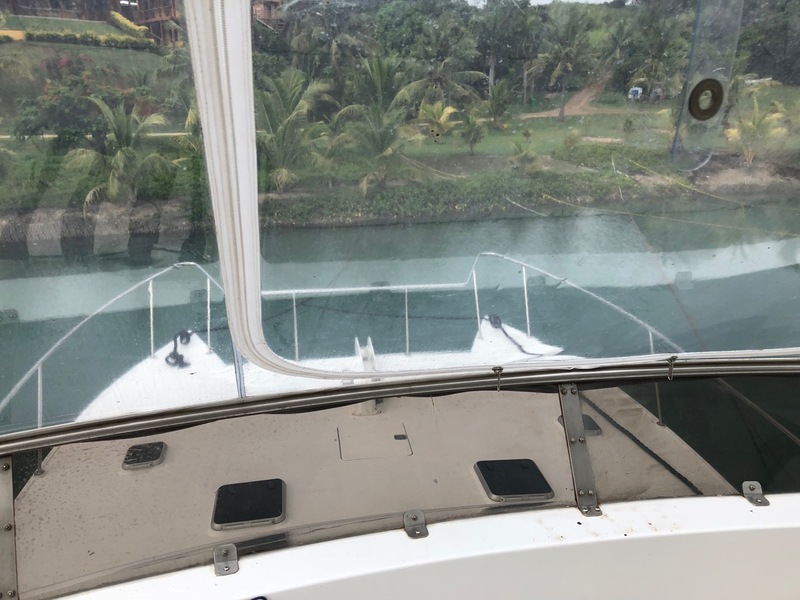 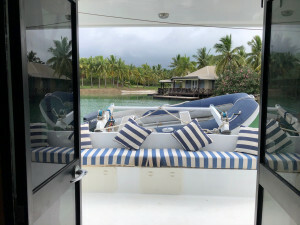 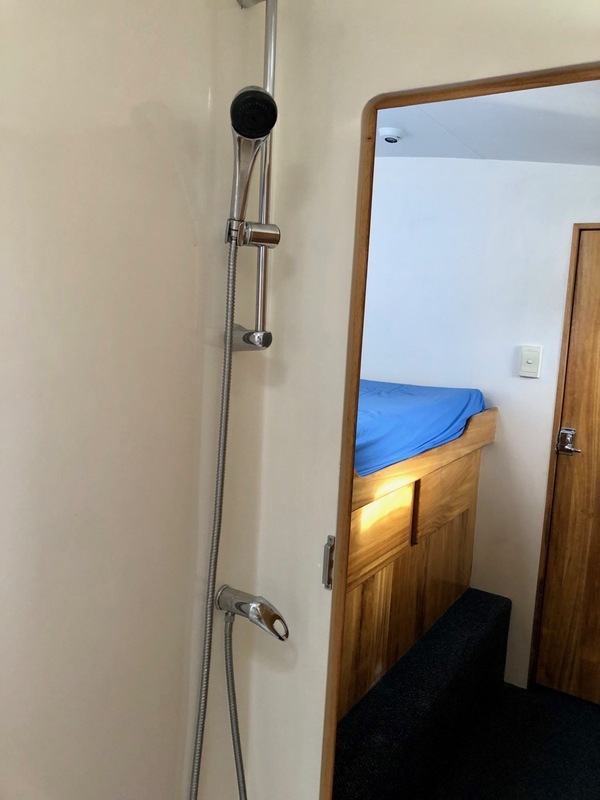 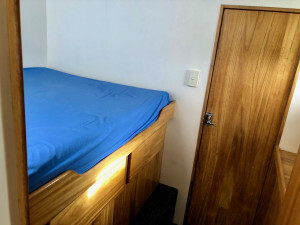 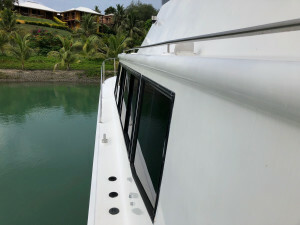 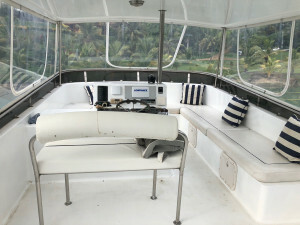 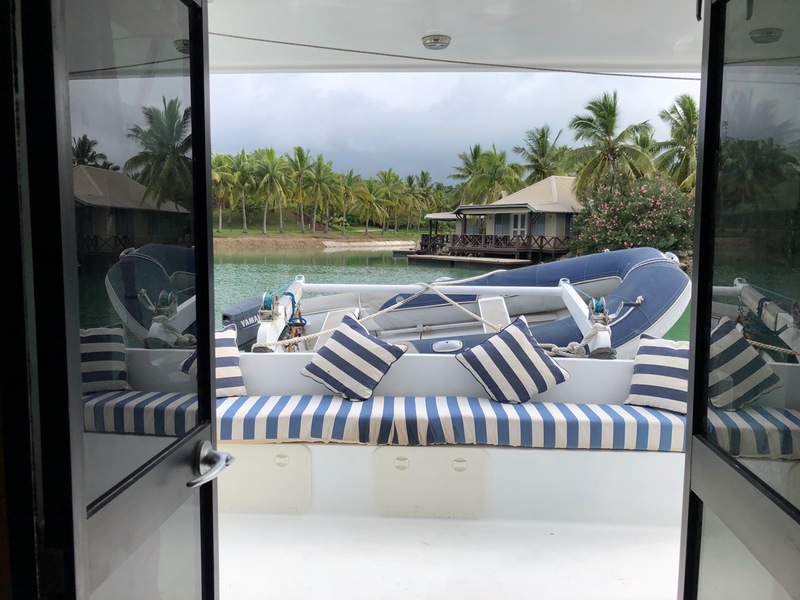 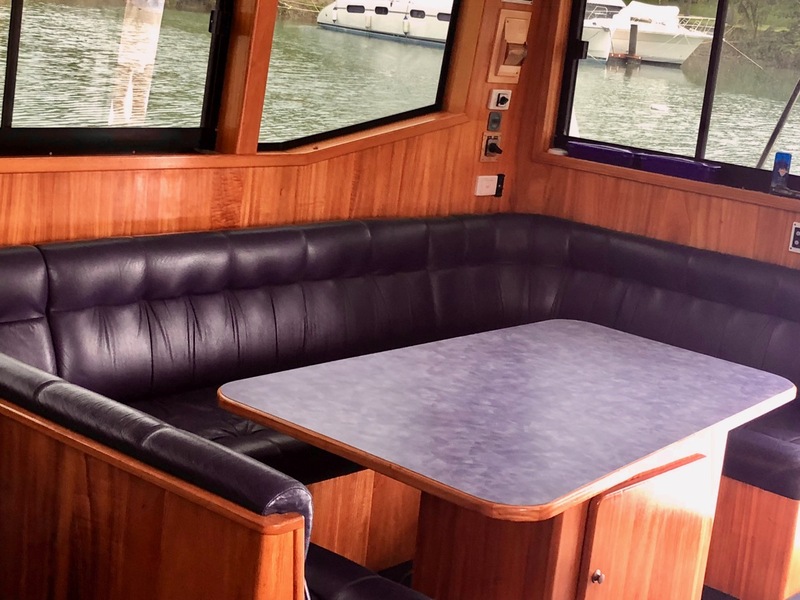 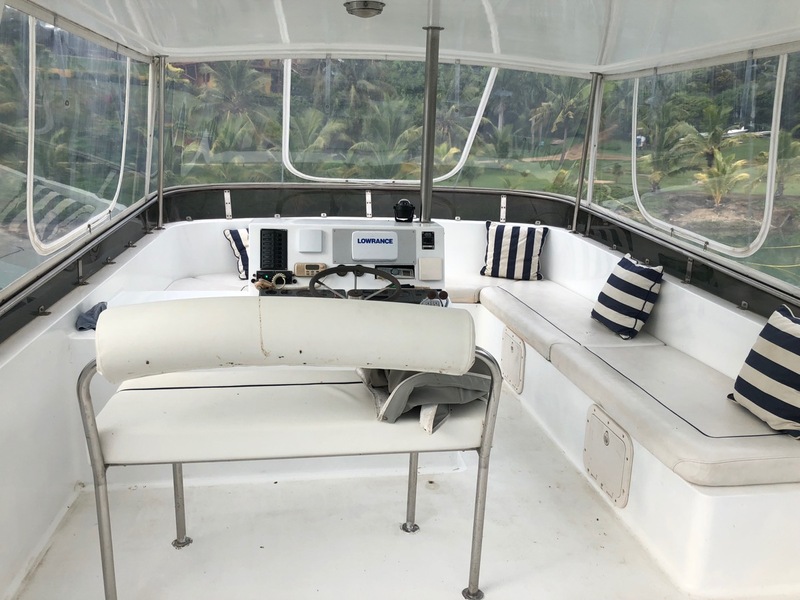 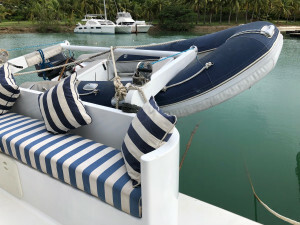 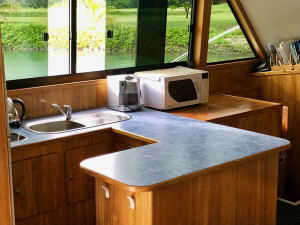 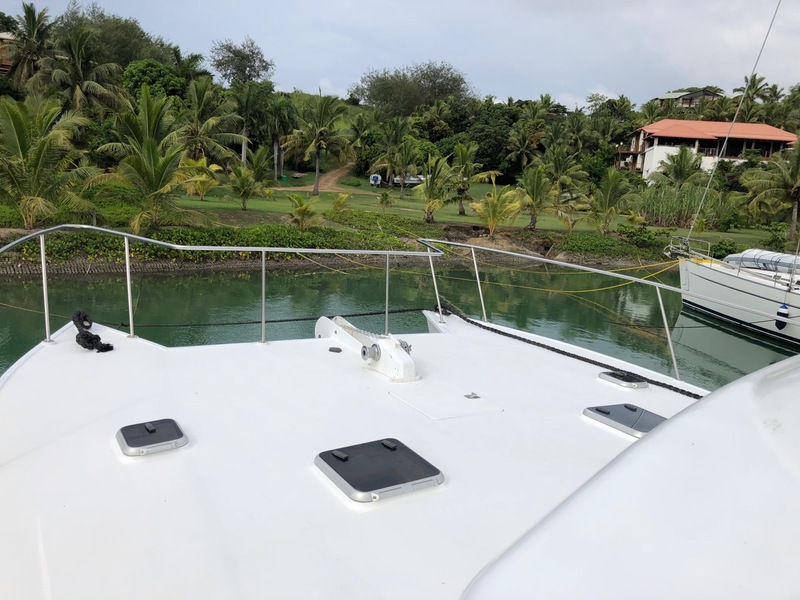 This boat is Australian registered ( no import tax needed for anyone wishing to bring her back to Australia), but can also remain in Fiji and New Caledonia indefinitely should the new owner wish to use her as a holiday home or here in paradise. 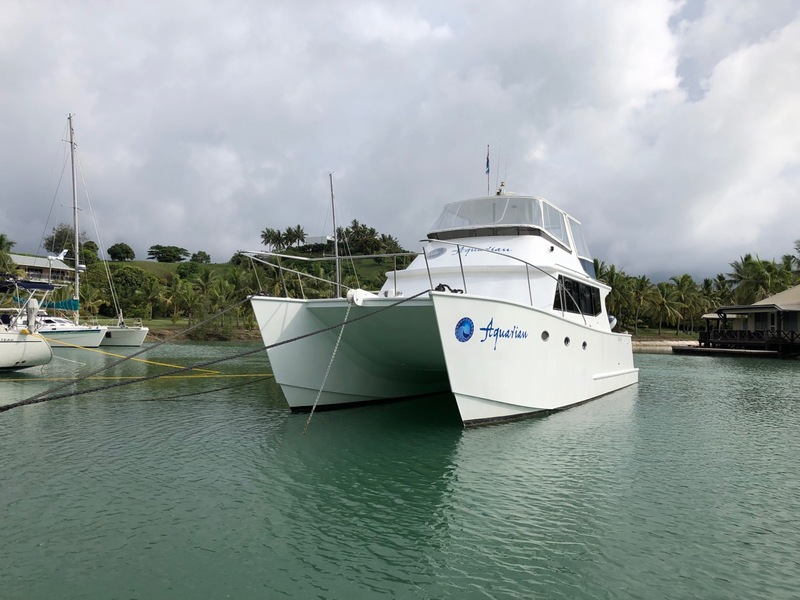 'Aquarian' is in 'turn key' condition and a great chocie for someone looking for a near-new passage-maker and serious offshore cruising vessel. She is accordingy equipped with all the necessary cruising electronics, water-maker, Genset, huge inverter, Alloy RIB on davits and extensive safety inventory. 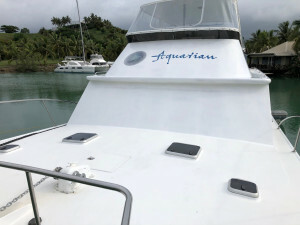 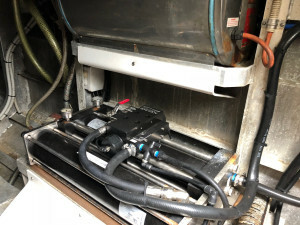 The boat is wired in 240V and 12 V.
'Aquarian' was re-sprayed in 2-pack Epoxy in 2014 and presents without a blemish. 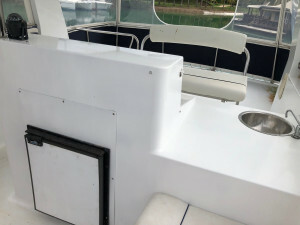 There is no bubbling of the paint, nor bump or scratches. Seen from any angle her hull presents as having litterally just been launched. 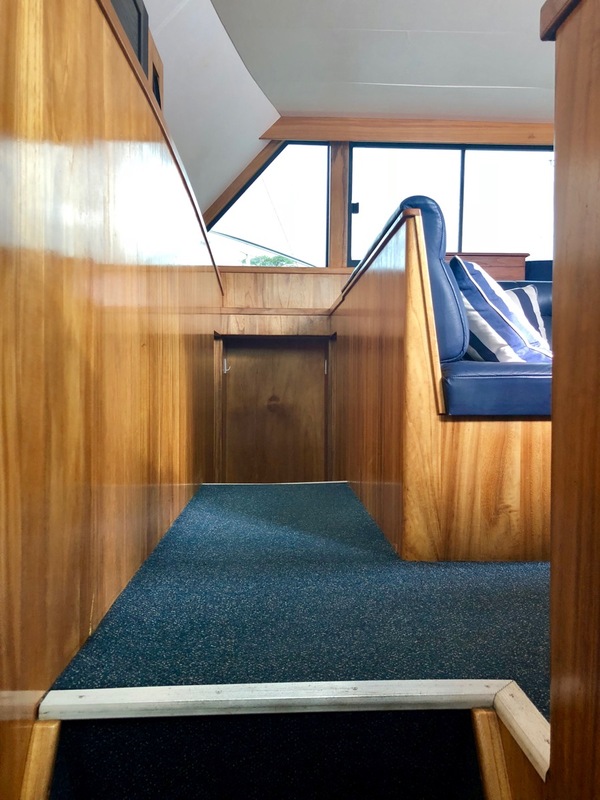 This is also true of the interior, back deck and flybridge, where the upholstery is now being fully replaced with new as part of the sale. Intelligently designed to marry muscle and ultimate competence at sea with a luxurious but practical interior, 'Aquarian's list of great features is impressive. 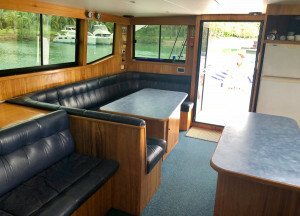 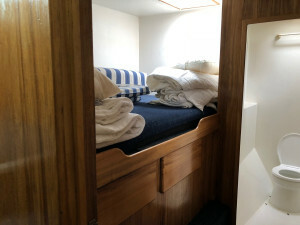 -Large aft cockpit with a lovely curved settee and large capacity storage hatches both under the floor and the seats. 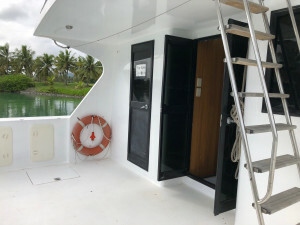 -Flush access through the two reinforced-glass doors to the saloon and main cabin. 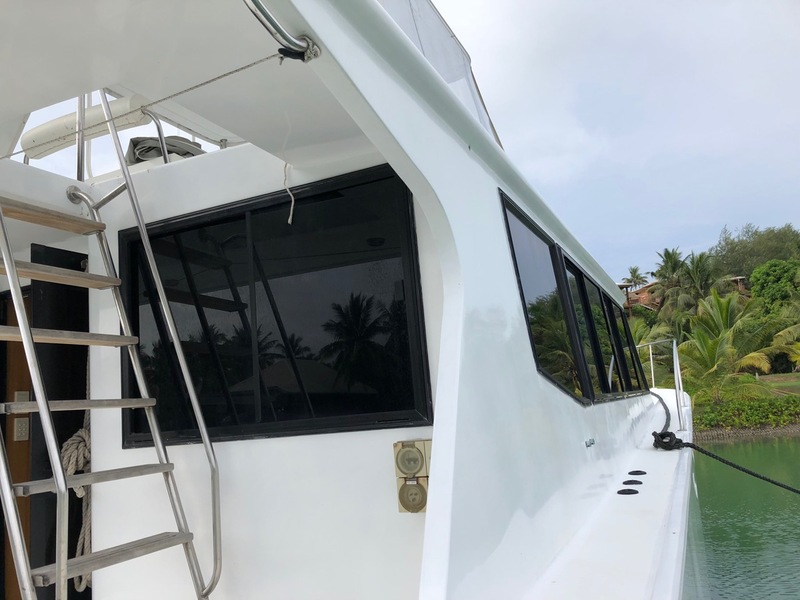 -A sturdy ladder reaches the huge flybridge, which combines a large sitting area, small bar fridge, more storage and the helm area, which is situated to offer great visibility around the whle ship and the forward deck. 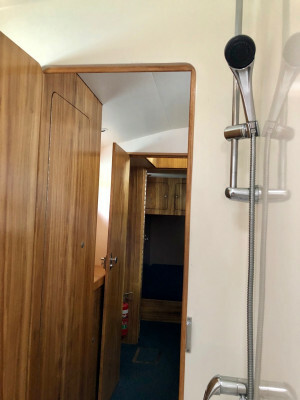 -A large head with fully separate shower is accessed via the cockpit and a full size reinforced glass door. 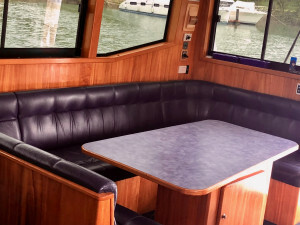 -Large saloon / dinette with separate lounge. 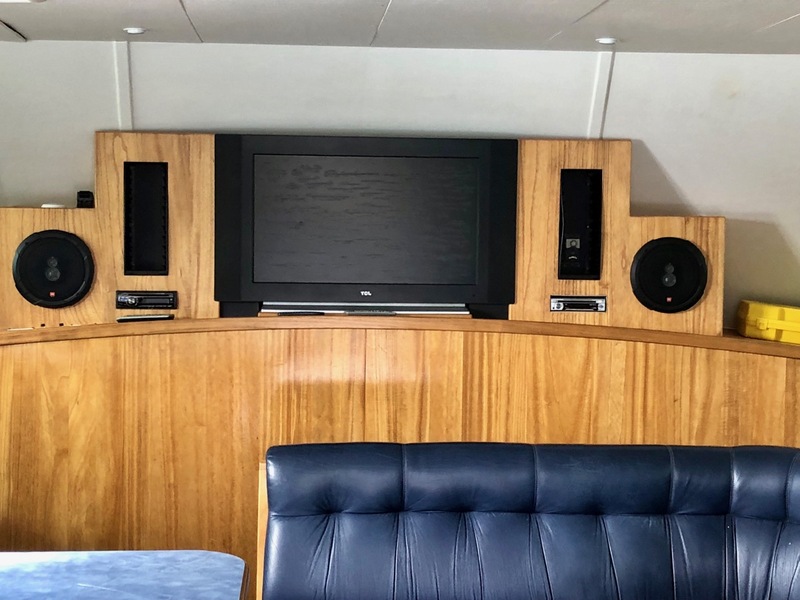 Flat screen TV / Home theatre. 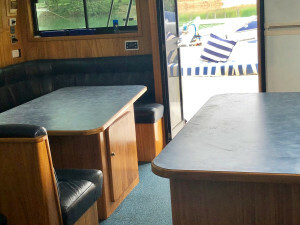 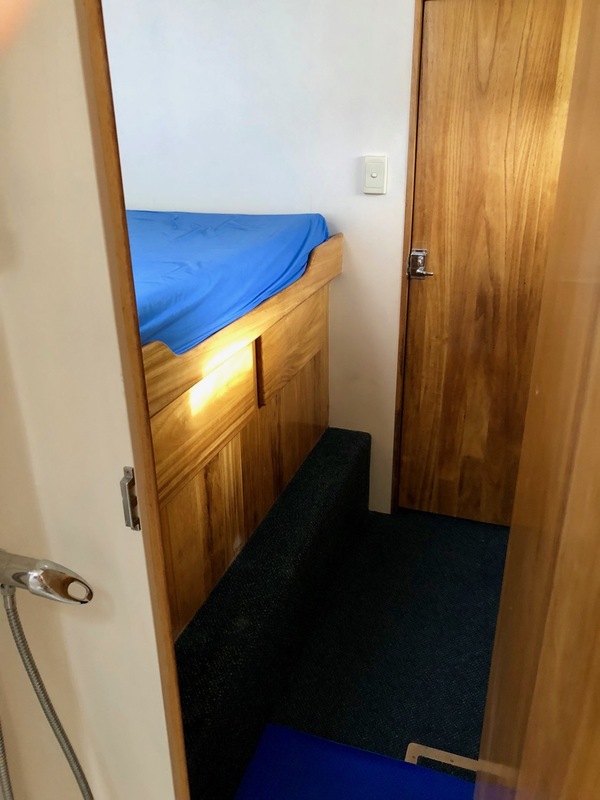 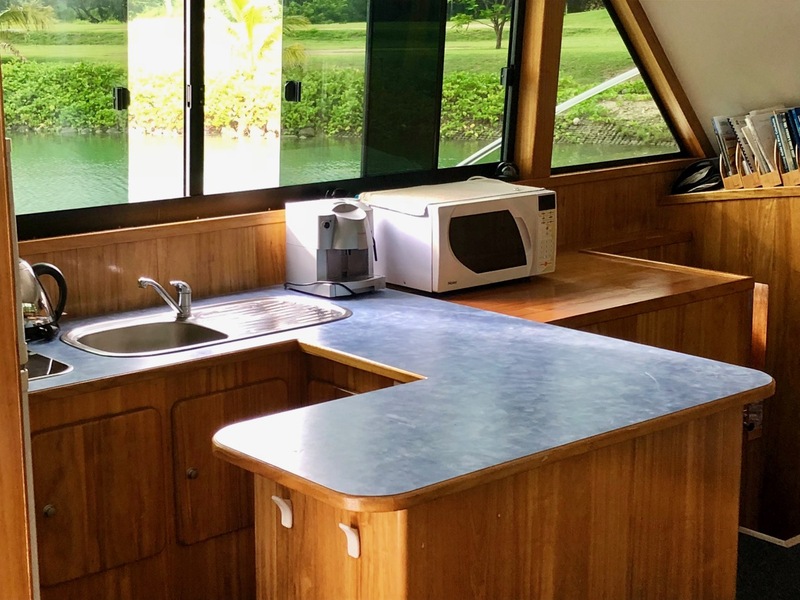 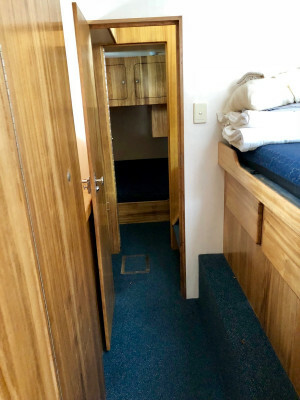 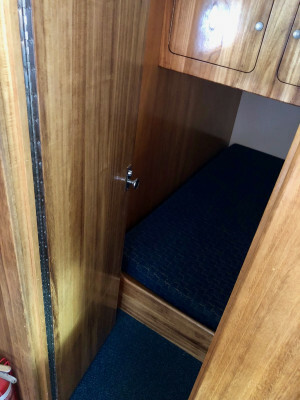 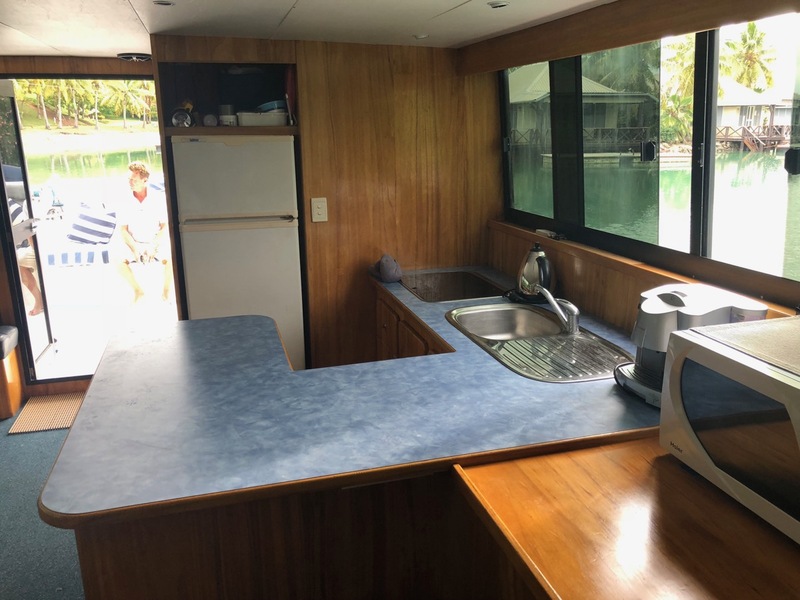 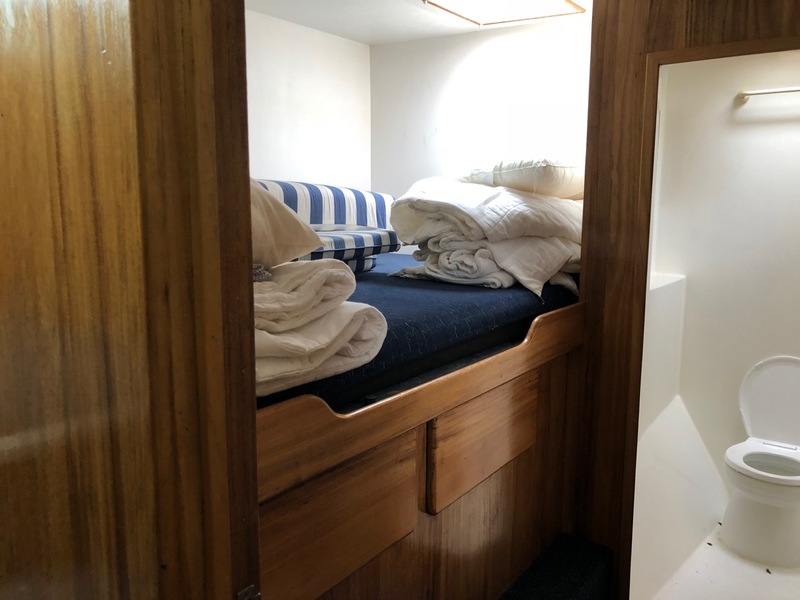 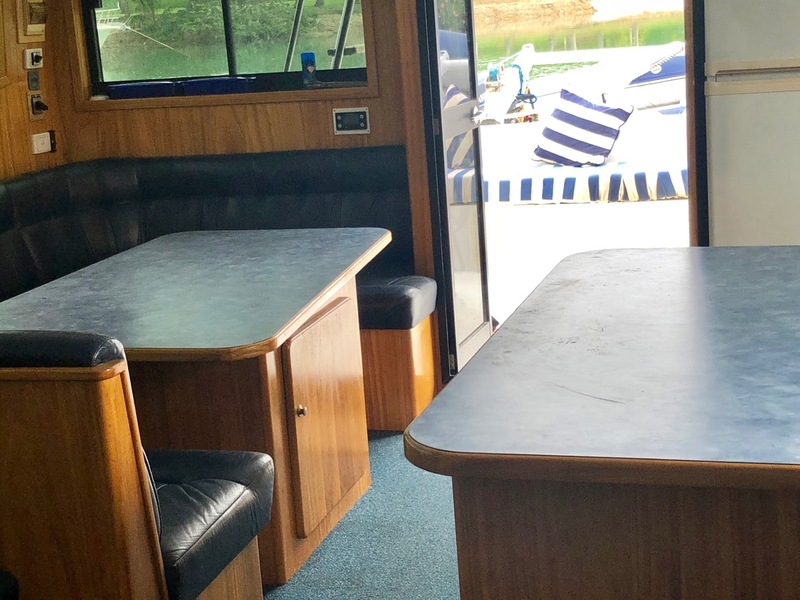 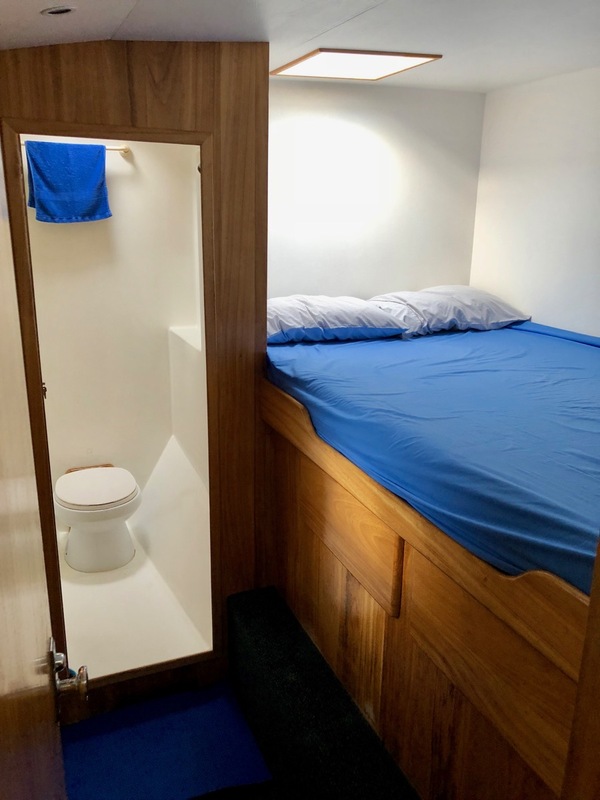 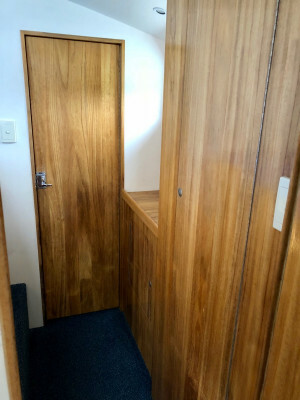 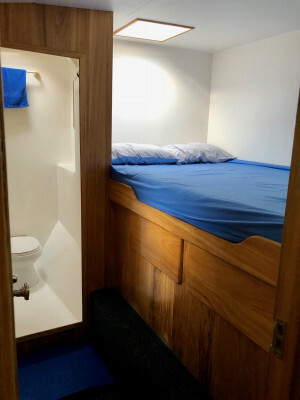 -Open plan galley on same level as saloon with ample food preparation area, full size stand up fridge / freezer, double SS sink, Mircowave and plenty of storage. -4 X large double cabins, 2 X with ensuite and plenty of storage / hanging lockers / drawers. 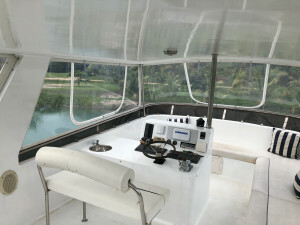 -Powerful air conditioning in main cabin effortlessly cools down the whole boat. 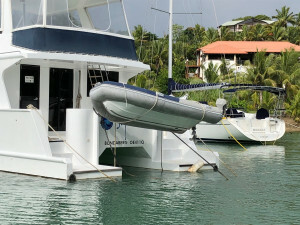 -2000L fuel capacity for serious offshore cruising. 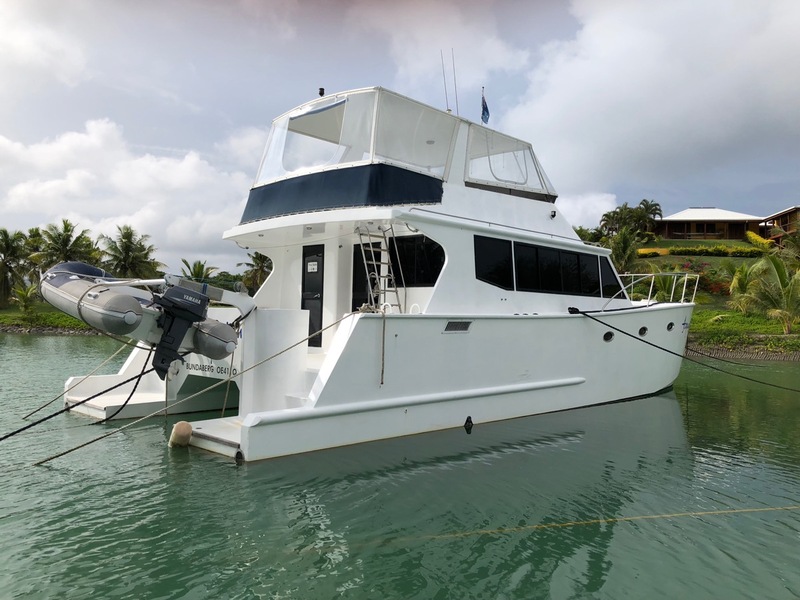 For more information and to receive the full inventory please contact our cruising yacht specialist Anna on info@nautilusyachtmanagement.com or call +61420882296.